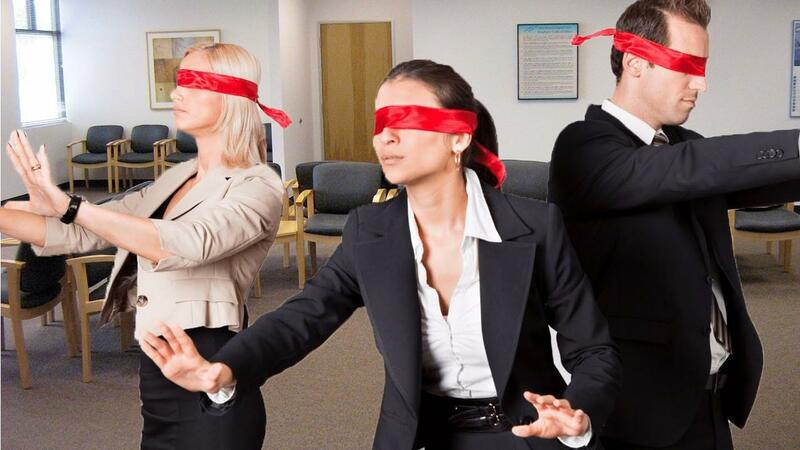 How blind are you to what’s going on in your practice? Now over the years I have been to all types of clinics and frequently their owners (and staff) have become blinded to some fairly obvious (and at times significant) things. I’ve seen termite holes in floor boards hidden by strategically placed pot plants. I’ve seen power points near children’s areas turned on and nothing in them preventing kids from electrocuting themselves. I even seen ceilings partially collapsed in waiting areas. It’s time to open your eyes! Auditing your practice but from a DIFFERENT perspective is critical and something you will need to revisit at set intervals. You will need to look from the patient’s point of view- literally! How would a mother with small children view your practice? · Are the power sockets covered up. · Is there a clear kid’s area? If so, is it away from the door which opens onto busy road. · Can my child swallow the toys? Are they clean? · Are the toys appropriate and not offensive? How would an elderly person view your practice? · Is there clear signage and large text on the forms? · Is there ramp access into practice? · Is there disabled access in the toilets? · Do the staff know your name? How would a child view your practice? · Is the table scary looking? · Are there cobwebs and spiders underneath? · Are the carpets clean? · Does the practice smell friendly and not like a hospital? · Do I get some kind of reward for good behavior/ or being brave? How do I take the blinkers off in my practice? 1. Get on your hands and knees and crawl through the practice from the front door, through every room right to the back. Take notes on what you see. 2. Survey your patients what are their likes and dislikes. Do they have any suggestions? 3. Ask you staff- particularly the new ones if something stands out. I think as chiropractors we acknowledge that our bodies are continually breaking down and rebuilding. I’m always surprised to see they view their practice differently. Your practice also is continually breaking down and ageing and often needs a new coat of paint every few years at least. When was the last time you professionally cleaned or updated your carpet? Can’t remember? Then it's time!. Addressing all of these things will bring new life into the practice, and will increase your pride in your working environment.